Rowan College at Burlington County Students! What’s your next career move? Come speak with an SNJ Millennials’ representative on April 24th from 11am - 1pm in the RCBC Mount Laurel Campus | Student Success Center, 1st Floor! See you there! Meet our SPECIAL GUEST, COREY RICE! Corey is a millennial entrepreneur and the owner of Venture Escape Room! Join the SNJ Millennials community for “Facing the Challenge!” as we discuss the importance of not giving up! NETWORKING, GIVEAWAYS & MORE! Continuing our “Building Momentum!” series focusing on providing key strategies on self development, business scaling and overall sustainability. Apply TODAY for SNJ Millennials’ Scholarship at www.snjmillennials.org/scholarship! Submissions are now OPEN! SNJ Millennials’ Scholarship was established to give back to students with a passion for business and encourage young entrepreneurs to pursue their dreams! Quandell Iglesia is a young and motivated businessman who inspires those around him to pursue their dreams and reminds them to give back to society. Iglesia is the founder and president of SNJ Millennials, a nonprofit organization that was launched in September 2017 to introduce young professionals to new business networks. It provides the appropriate tools to those individuals, so they are fully equipped for their future endeavors. This includes, workshops, networking mixers and business educational resources for young business professionals. Iglesia was recently featured in Suburban Family Magazine as a “Star Citizen”, “Names to Know” in South Jersey by South Jersey Magazine, Newspaper Media Group’s front cover, South Jersey Federal Credit Union's 2018 Spring Magazine and was the youngest recipient who received the SNJ Business People "40 Under 40" Award. In addition, he also received “Entrepreneur of the Year” by the Vineland African American Community Development Corporation (VAACDC), the 2018 Young Professionals Leadership Award by the Burlington County Regional Chamber of Commerce, Spirit of Community: Bob Shryock Award by the Volunteer Center of South Jersey; just to name a few. Quandell Iglesia will be sharing his story as an nineteen year old entrepreneur and a few tips in developing relationships beyond social media, building your personal networks and more. Rowan College at Burlington County Students! What’s your next career move? 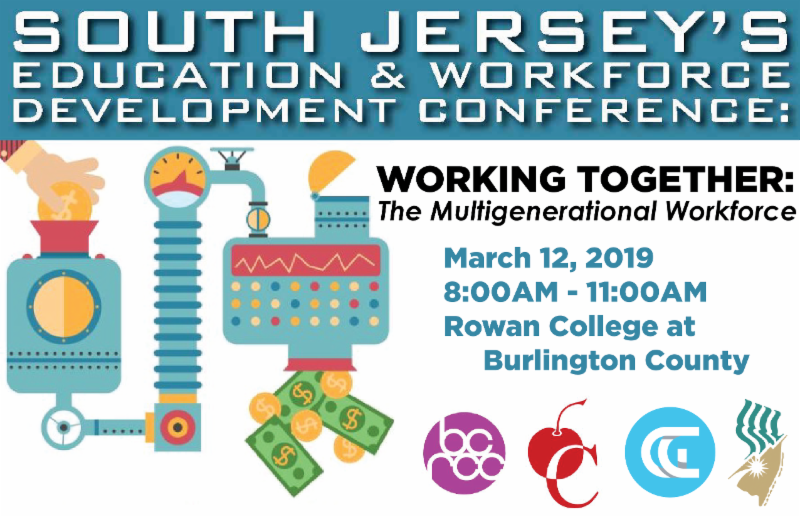 Come speak with an SNJ Millennials’ representative on March 20th and April 24th from 11am - 1pm in the RCBC Mount Laurel Campus | Student Success Center, 1st Floor! See you there! Charles Roberts - Social World Networking Professionals in conjunction with Ashley Owens - Ashley Assists, LLC, Quandell Iglesia - SNJ Millennials and Josh Buchter - Wolf of Broad Street Real Estate Events presenting: Network in the City, Building Bridges to Success with Diversity and Inclusion! In attendance we will have — account executives, attorneys, brokers, CEO's, chemists, consultants, directors, financial advisers, founders, government officials, graphic designers, marketing directors, professors, real estate brokers, realtors, recruiters, stylist and more! Join the SNJ Millennials community for our upcoming panel “Breaking Barriers” sponsored by Advocare South Jersey Pediatrics, Samaritan Healthcare & Hospice, South Jersey Federal Credit Union and the Volunteer Center of South Jersey. With guest speakers Cody Miller (Volunteer Center of South Jersey), Joccola Thomas (South Jersey Federal Credit Union) and Thanuja Hamilton (Advocare South Jersey)! SNJ Millennials is a PROUD partner with Robins’ Nest: Coffee & Connections! Do you have a uniquely original business idea? Would you like to win a cash prize for your business idea? Do you aspire to own your own company one day? You may be one of RCBC's future Startup Stars! Please note: Your plan or concept must be an original, authentic, feasible business idea. The Startup Stars event on January 31 at 6 p.m. in the Votta Hall Auditorium is open to the general public. See the exciting presentations of tomorrow's leaders, listen to their amazing ideas and support them in reaching for the stars. Meet our SPECIAL GUEST, Frank Rizzieri! Frank is an award-winning stylist, educator and entrepreneur. He is a teacher, celebrity hairdresser, salon owner, and editorial and New York Fashion Week stylist. Join the SNJ Millennials community for “The Power of You!” in conjunction with Rizzieri Aveda School as we celebrate the new year! HEADSHOTS, GIVEAWAYS & MORE! Starting our “Building Momentum!” series focusing on providing key strategies on self development, business scaling and overall sustainability.